서울신포니에타는 바이올리니스트인 김영준에 의해 1987년 12월 창단된 직업 실내악단으로서 정상급 연주자들이 모여 실내악의 깊은 내면세계와 아름다움을 창조하는 단체이다. 1988년 4월 피아니스트 "예핌 브론프"을 초청하여 창단연주를 가진 이래 400여회의 의욕적인 공연을 통하여 국 내외 정상급 연주자들을 초청, 각종 연주회를 개최하였으며 고전에서 현대음악까지 다양한 레파토리로 폭넓은 음악적 영역을 형성하면서 꾸준한 성장을 보이고 있으며 2007년 한국음악 비평가협회로부터 한국음악대상을 수상하였다. 또한 음악의 본고장인 오스트리아에서 개최된 밀슈타트 국제음악제와 카라얀이 음악감독으로 있던 짤츠브르크 궁정음악제, 2006 일본 쿠사추 아카데미 국제음악제, 2010-2011 불가리아 바르나 국제음악제에 정식 초청되어 연주회를 펼치므로서 현지 음악전문지와 언론사 및 평론가들로부터 높은 음악적 평가를 받은바 있다. 서울신포니에타는 국내 음악계의 선도와 발전을 위하여 매년 10여회의 정기연주회와 기획연주, 지구환경 보존을 위한 환경음악회, 음악계의 후진양성을 위한 청소년음악회, 공단 근로자 및 가족초청 음악회, 평소 공연장을 찾지 못하는 소외계층을 위한 방문연주회 등 다양한 연주회로 음악, 교육, 사회봉사의 역할에 노력하고 있으며, 실내악의 예술적 정신으로 미래를 향해 꾸준히 노력을 하고 있다. Seoul Sinfonietta is established by violinist Young Zun Kim in 1987, who has been the leader and conductor of it. Since its inaugural Concert in 1988, Seoul Sinfonietta has performed over 400 concerts with well-known artists as soloists, and repertoire consisting from early classical period to contemporary works. Aside from their concerts in Korea,Seoul Sinfonietta has been invited to play in International festivals such as the Milstadt Music Festival, Salzburg Place Music Festival and Kusatsu festival in Japan. Their concerts around the world have been praised by media and audience alike. 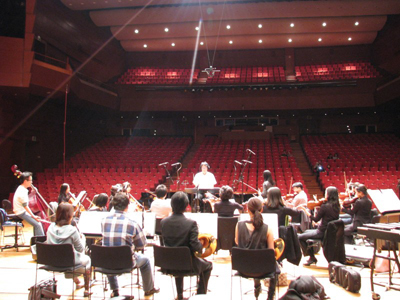 One of Seoul Sinfonietta’s goals is to educate and cultivate classical music to general public. In effort to do so, Seoul Sinfonietta performs with next generation musicians, performs for industry workers and their families, and especially for ones who doesn’t have chance to enjoy music at a live concert. Presently, members of Seoul Sinfonietta hold prestigious degree from schools in United States and Europe. Also, they are scheduled to play more then dozen concerts upcoming year. Seoul Sinfonietta is also involved with many non-profit organizations such as Environmental Preservation of the Earth, to fulfill its duty as one of leading cultural organization. 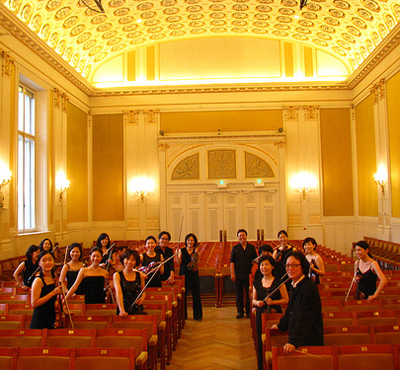 Seoul Sinfonietta, which received among others "the grand prix of the year"from the music reviewers association in 2007, is striving to be characterized as a Chamber Ensemble with an artistic spirit to lead the Korean music society.